Films based on classic literature are often devoured by lovers of the genre, while the rest of the cinema-going public run as far as they can in the opposite direction. But while Far From the Madding Crowd still sits largely in this niche, it manages to transcend others in the genre by involving a story that not only shows off beautiful language, but where stuff actually happens beyond a verbal sparring match in some rich wanker’s garden. At the centre of Thomas Hardy’s classic novel is Bathsheba Everdene (Carey Mulligan), a young woman who inherits her uncle’s estate and throws herself into managing the upkeep of the farm. Bathsheba attracts three vastly different men: a loyal shepherd, Gabriel Oak (Matthias Schoenaerts), the wealthy bachelor next door, William Boldwood (Michael Sheen), and a flighty Sergeant, Francis Troy (Tom Sturridge). Michael Sheen has never been so adorable. Though it may sound like old-fashioned crap (“there’s nothing more important than finding a man to see you through the night!”) Hardy’s story positions Bathsheba as a strong, independent woman. She doesn’t go the obvious route of marrying into more money, but she does make mistakes where matters of the heart are concerned. Among her potential suitors are two absolutely beautiful souls and one prick, just for balance. While Oak and Boldwood have her best interests at heart, they are never painted as her necessary saviours, while Bathsheba doesn’t let her pride get in the way of asking for help either. Even Sergeant Troy, the prick, isn’t cast as an outward villain, with Hardy successfully avoiding lazy character development. Director Thomas Vinterberg (who made the compelling Danish drama The Hunt) and screenwriter David Nicholls (responsible for the recent adaptation of Great Expectations) deliver an exquisite adaptation of Hardy’s story, moving the narrative along at a reasonable pace. Though there are times when the film seems at risk of getting bogged down in particular events, it manages time and time again to move swiftly along. Characters sometimes take a while to find their words, but this only serves to heighten the anticipation of the viewer. Cinematography by Charlotte Bruus Christensen is stunning, with Victorian England looking more beautiful than ever before. The landscapes are awe-inspiring, and Bathsheba and Troy’s rendezvous in the woods feels like something out of a fairy tale (though more sexually charged). Janet Patterson creates some gorgeous costumes for Bathsheba, and the film is accompanied by a charming score by The Great Gatsby’s Craig Armstrong. Carey Mulligan has a likeability factor that so many others lack. Whereas actresses like Keira Knightley and Jennifer Ehle portray a certain snobby charm, Mulligan radiates nothing but warmth and spirit. 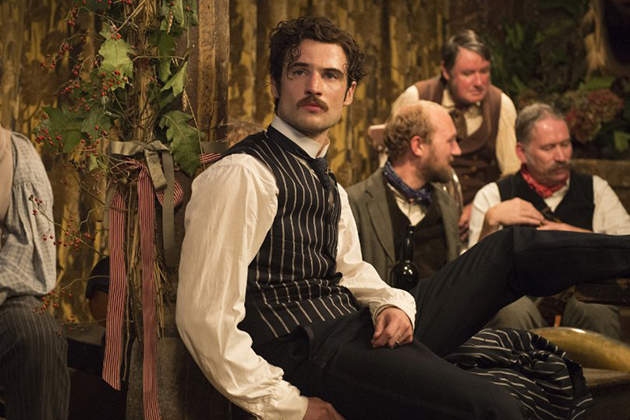 As her potential suitors, Matthias Schoenaerts is dreamy enough without overdoing it, Michael Sheen is heart-crushingly sweet, and Tom Sturridge is sufficiently douchey with his hipster mo. Audience enjoyment of Far From the Madding Crowd will depend somewhat upon viewers’ fondness for the classics, but this isn’t a pre-requisite. As someone who despised studying Jane Austen’s Pride and Prejudice back in high school, and who thought the recent film adaptation of Wuthering Heights was the most boring film to be released in years, this reviewer certainly approached this film with trepidation. While fans of the genre will no doubt eat this film right up for breakfast, those on the fence can be rest-assured. Far From the Madding Crowd is far from the tedium you might expect. Great review! Can’t wait to finally read the book and eventually watch the film.